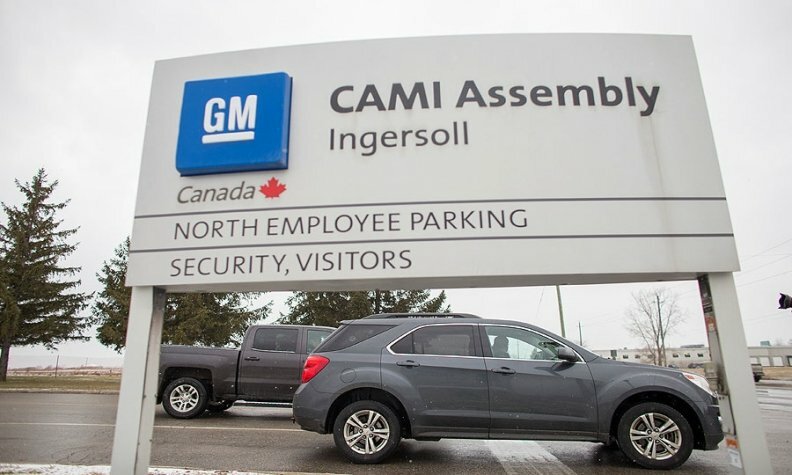 General Motors on Wednesday warned leaders of Canada's Unifor labor union that it will start to wind down production of its popular Chevrolet Equinox small crossover at an Ontario factory unless workers there call off a month-long strike. The strike has been fueled by the union’s local chapter’s desire for more job security -- it wants GM to designate the plant the lead producer of the Equinox -- and the national body’s opposition to the North American Free Trade Agreement. A GM official familiar with the discussions says there is a high degree of frustration with the impasse that started Sept. 17 when about 2,500 employees walked of the job. The official said in doing so, Unifor has created a problem that doesn’t exist. Unifor leader Jerry Dias told Reuters on Wednesday that GM officials said they would ramp up production of the vehicle at two plants in Mexico that build the Equinox and a similar model, the GMC Terrain if the walkout is not called off. "GM just told us today that they are going to ramp up production in Mexico," Unifor President Jerry Dias said by phone from Washington. "They have declared war on Canada." GM on Thursday had no immediate comment in response to Dias' statement. GM has plants in the United States that are underutilized, but retooling them to build the Equinox would be expensive. The Exquinox is one of the hottest selling smaller crossovers in North America and the automaker says it needs to start exploring other options for its production. U.S. sales of the Equinox surged 22 percent to 212,735 vehicles through the first nine months of the year. GM plans to study how quickly key suppliers to the Ontario Equinox plant could move their operations to accommodate a shift in the vehicle's production, the person familiar with the discussions said on Wednesday. However, that person said no final decision on CAMI’s future has been made, but that the time frame for getting a deal done is narrowing. GM's decision to build the Equinox and Terrain in Mexico is a major issue in the contract dispute between the automaker and the Canadian union. Dias said he would not call off the strike. "This is the big issue," Dias said of the strike. "Once we solve this, everything else will fall into place." The union wants lead producer language it says would strengthen the plant’s position by giving it more production if Equinox sales rise and making it the last to scale back production if sales fall, the union says. But, the automaker recently invested $800 million to retool the plant for the new Equinox model and the automaker believes that should be commitment enough and that putting it in writing isn’t necessary. The person familiar with GM’s view says no such language or designation is in any other contract. The union also objected to GM's decision to lay off 600 CAMI workers as it phased out production of the last-generation GMC Terrain SUV, and launched production of new generation Terrain models along with the Equinox in Mexico. The CAMI plant was projected to build about 210,000 vehicles in 2018, while two plants in Mexico together were projected to build about 150,000 vehicles next year, according to AutoForecast Solutions, a forecasting firm. Unifor's Dias has blamed NAFTA for the job losses, complicating Canadian Prime Minister Justin Trudeau's effort to promote the benefits of open trade in response to U.S. President Donald Trump's criticism of the deal. U.S., Canadian and Mexican negotiators began another round of talks this week to modernize the agreement. The Equinox was the second best-selling model in the United States Chevrolet lineup in September, and GM had just 41 days worth of the vehicle in stock at the end of last month, according to Automotive News.